Mike Trees, a longtime friend of our head coach Stephen Farrel, attends our training sessions as a guest coach from time to time. He coached some of our sessions during the World Masters Games a few weeks ago, and offered some insight into the importance of doing running drills. We all think we can run, so why do run drills? Good running form does not come by accident. It is the result of hard work, effort, and smart training to work on your weaknesses. 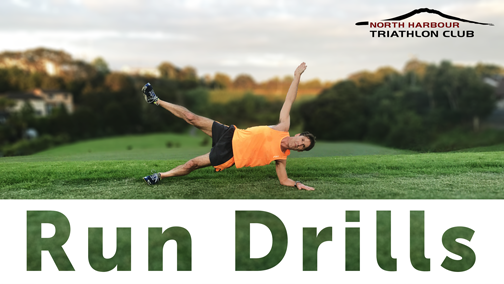 Good run drills will break down the running action into its basic elements, then allow you to practice the parts and improve each element before combining them. If it also incorporates some balance and coordination work, a few good core drills, muscle activation exercises, and a little strength work, then the result will be a more efficient running action. Why do you need to be efficient ? Because you will go further and faster using less energy and you will reduce the possibility of injury, and less injuries mean more meaningful and productive training. On Mondays as a guest coach I have been giving North Harbour Tri Club members a few pointers on how to improve their form. Now is the perfect time to work on form as you take stock and rebuild your body for next summer's race season. We use a short, but steep hill, and do these drills uphill, for about 30 meters each. I suggest 4 sets of these drills, with some core work and strength exercises in between. With a warm up and down the set takes about an hour. Did everyone complain ? Yes ! BUT, did they enjoy it ? Yes ! This is not a workout you would like to do on your own but as a group you will love it. And remember if it was easy, everyone would be doing it. Join us every Monday evening for run drills at 5.15pm at the carpark of Takapuna Running Club, Akoranga Drive, Northcote.